What is the English equivalent of 相思断? 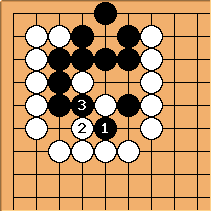 This Chinese go term appears in the answer commentary to problem 377 of Weiqi Rapid Drill 800 Problems. Tempted to call it a cross cut based upon the usage of that term in Tesuji page 24ff. unkx80: I don't have Tesuji, but I can say that the typical usage of 相思断 refers to the crosscut tesuji like as shown in this diagram. Herman Hiddema: Which would mean it refers to the double crosscut to connect technique, I assume? Is there a difference between 扭断 and 相思断 ? 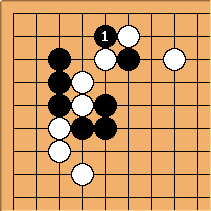 If there is, in what situation would one use 扭断 in place of 相思断 and vice versa ? For what I've seen here, 扭断 seems to refer to cross-cuts in general, while 相思断 refers to the specific usage as a tesuji to connect. This would be similar to the use of 立 (lì) for a descent (or sagari), with the terminology 金鸡独立 (jīn jī dú lì) for a specific tesuji employing this move, the Golden Chicken Standing on One Leg.